Marian Chapman, age 82, of Salem, died on Wednesday, February 13th, at Doctor’s Nursing and Rehabilitation in Salem. She was a housewife of the Christian Faith. Graveside services for Marian Chapman will be held at two Thursday afternoon, February 14th, at Pleasant Hill Cemetery in Mt. Vernon, with Doug Romine officiating. Burial in the Pleasant Hill Cemetery in Mt. Vernon. 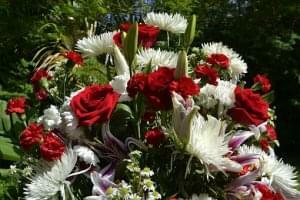 The Rogers-Atkins Funeral Home in Salem is in charge of arrangements. Marian Chapman was born on November 6th, 1936 in Marion County to Walter Arnold and Mildred (Cheeley) Arnold. She married Donald M. Chapman on November 28th, 1970 in Benton. Survivors include two sons: Michael Hodge of Missouri and Jerry Dale Hodge of Texas; one step-daughter: Donna Durham of Salem; one sister: Alice Beasley of Iuka; one step-granddaughter: Tammy Branon of Centralia; and several nieces and nephews.